No one ever said that parenting was an easy job. Being a parent is arguably one of the hardest jobs out there. This is largely in part to the fact that children don’t come with instruction manuals. Most of the skills required to raise kids is learned through either trial and error or comes from talking to another, more experienced parent. Due to this fact, most parents have a lot of questions about varying aspects of raising children. Many of these questions are too risky to leave up to trial and error discovery. A perfect example of a question like this would be at what age you can leave a child alone in a vehicle? This is a valid question, since there is obviously some point when this becomes okay. After all, people leave adults in alone in their cars all of the time. So, at want point are ready to be left alone in the car while the parent makes a quick stop somewhere? Before we answer the question, it is a good idea to look at why kids shouldn’t be left alone in vehicles. Just about everyone realizes that kids are very vulnerable. This is especially true when they are very young. They are still learning how the world works, or how their body works. They also don’t have the best logic skills, such as cause and effect. The child can do something to the vehicle, such as putting it into gear or lock themselves inside with the keys. Some horrible person could see the child alone and kidnap him or her. If the weather is warm outside, the child could overheat inside the vehicle. All of these things can be very bad and dangerous. No parent ever wants to experience something like this happening to their child. While they tried to run a quick errand inside. When Can Kids Be Left Alone in Cars? As with leaving children home alone, the decision to leave a child alone in a vehicle is often dependent on the child. All children mature at different rates. Some kids may become mature enough to be left alone in a vehicle for a few minutes sooner than others. It is up to the parent to decide when the child is ready to handle that kind of responsibility. 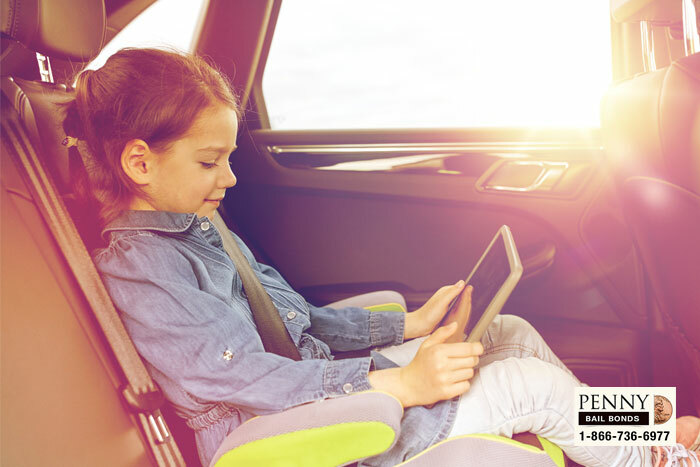 While this can be pretty tough for parents to determine, parents living in California have a little bit of guidance with California Vehicle Code (VC) 15620. This law states that no parent or guardian of a child under the age of six can leave the child unattended in a vehicle. The only time a child under the age of 6 can be left in a vehicle is if a child 12 or older is in the vehicle as well. Breaking VC 15620 is an infraction level offense. This means that a person will not face any jail time, and will be fined $100. Something else to consider is that the law changes from state to state. Currently 19 states haves laws regarding leaving children unattended in vehicles. This means that parents who are traveling should be aware of which states have these laws, and what exactly they are. For instance in Connecticut, it is illegal to leave any child under the age of 12 alone in a car. No one ever said raising kids would be easy, and since every child is different, what works for some kids may not work for others. Parents need to keep that in mind when raising their children, as well as know what laws there are here in California regarding child safety. By doing that, a parent can keep their child safe and happy, and keep themselves out of trouble with the law.